My wife and my daughter are genealogy fanatics. While I slavishly review fantasy football lineup options, they are on their own laptops using ancestry.com to see if our 13th century forebears (or foreBaers as the case may be) were more English than Irish. Recently, my wife logged on to ancestry.com to see that someone had attached some new details to her tree. A note for the uninitiated: the system works collaboratively, so your 9th cousin could be doing research and discover something that impacts your own lineage. This new addition said that there may be some long ago Native American elements in the family history. This addition was of great interest, as its been a longstanding rumor in her family that there may have been a secret Sioux romance a long while back. To get some clarification on who added this information to the collaborative family tree, and the underlying source of the discovery, my wife sent an evening email to the help desk. The reply came the next morning. This is a quick turnaround, especially overnight, as companies take an average of 44 hours to reply to an email – a fact I discovered when I wrote my new book, Hug Your Haters. This email creates far more questions than it answers, but also provides some opportunities for customer service lessons. Yes, the email reply came in 16 hours, but it didn’t provide any value to the customer. And if you are going to use an autoresponder to encourage customers to use other channels, why doesn’t that autoresponder email get delivered in five minutes? Why is it a 16-hour delay? My wife selected email because she prefers email. If she preferred the phone, she would have used the phone. Businesses must support customers in the channels the customer prefer, not the channels the business prefers. I would argue that this is especially true in a circumstance like this where the customer is paying an annual subscription fee to use the platform. Now, if she had contacted ancestry.com in a channel that is not typically used for customer support (Youtube comment, Instagram comment, Snapchat, sky writing) then it would make more sense for the business to redirect her to another support method. I thought for a moment that perhaps these memberships specifically exclude email support (although it is more common for companies to exclude phone support). I checked her membership, and in fact no ancestry.com packages prohibit email support. Curious. Evidently, ancestry.com prefers to interact with customers via phone. (more on that below) But even if that’s the case, companies should never prohibit customers from using a contact mechanism. Saying “Due to the volume of emails we’ve received, we will not be able to respond to replies we receive to this email” is both harsh and difficult to believe. 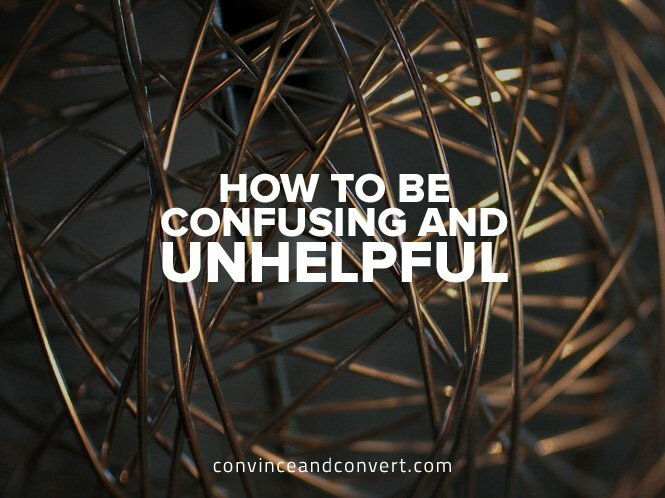 You don’t want people to email you, and you refuse to answer emails, yet so many people continue to do the thing you prohibit that it causes you to disallow it? The circular logic here is so acute that I cannot determine whether it is more confusing or more unhelpful. This is such an avoidable error. The email itself says “We value your membership and are committed to providing excellent customer service.” Yet, by its very EXISTENCE this email invalidates that claim. Further, the email says they are unable to respond due to “high contact volumes” yet they were able to provide THIS email quickly. This creates doubt and dissonance among customers. And, the “so many people email us that you can’t email us” bit falls into this category too. I simply cannot fathom why a business would demand that customers call them on the phone. First, it is dramatically more expensive to provide support this way (something like 5-8 times more expensive on a per customer basis). Second, the phone is often viewed as a hassle for customers and this perception is growing rapidly. I give ancestry.com a lot of credit for having excellent support forums and message boards, and my research in Hug Your Haters found that customers actually prefer self-service whenever possible. But to force customers to call? Remarkable. I figured that the gambit must be to try to upsell customers to a more expensive membership tier when they were on the phone. So, my wife called in, and you won’t believe what happened. She called the phone number listed in the email, and her call was answered within three minutes. This is exceptionally quick and indicates that while ancestry.com eschews email like Tiger Woods runs from brunettes, they have a strong telephone support program with plenty of personnel. This is, by all accounts, excellent telephone service. 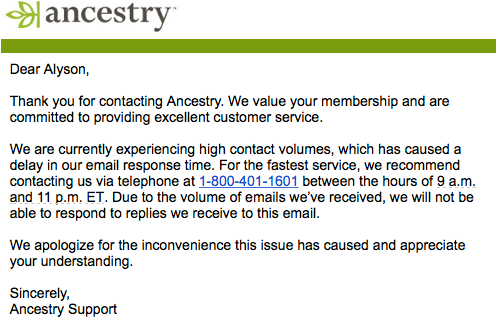 Is ancestry.com so committed to delivering great support via phone that they refuse to water it down via email? I suppose that could be the answer to this conundrum? I don’t believe I’ve ever heard of a company taking that approach, however, except in a regulated industry like health care or financial services, where they don’t want written records floating around on email. Befuddled, I turned to the extraordinary Hug Your Haters Facebook Group for their ideas of what could be afoot. What do you think? Have you ever seen anything like this, how would you feel if this happened to you, and what could be the explanation for this interaction, which manages to be both confusing and unhelpful?